Top stars will be on parade when Juventus play Monaco in the return leg of the UEFA Champions League semifinal. Juventus host Monaco on Tuesday in the second leg of the UEFA Champions League semi final after a 2-0 victory in the first leg. Juventus is looking to sustain their first leg victory for a place in the final. Bounce News looks at some players who could be outstanding in Tuesday’s fixture. Apparently the oldest player on the pitch, the 39-year-old goalkeeper is the captain of both Juventus and the Italy national team. Buffon holds the record for the most clean sheets in Serie A, and with the Italy national team. He also holds the record for the longest streak without conceding a goal in Serie A history: over 12 league matches, he went unbeaten for 974 consecutive minutes during the 2015–16 season, as well as having achieved the most consecutive clean sheets (10) in Serie A in that same season. He scored the two goals against Monaco that puts Juventus on the verge of winning a third UEFA Champions League trophy. On 5 April 2017, Higuaín scored twice away to Napoli in the 2016–17 Coppa Italia second semi-final leg to put Juventus through to the final 5–4 on aggregate, although defeated 3–2 in the final. The following week, he became the first player to score more than 20 goals in his debut season for Juventus since John Charles and Omar Sivori in 1957-58 when he scored a brace against Chievo. On 15 April, Higuaín scored both goals in a 2–0 away win against Pescara, which included his 200th league goal in Europe. 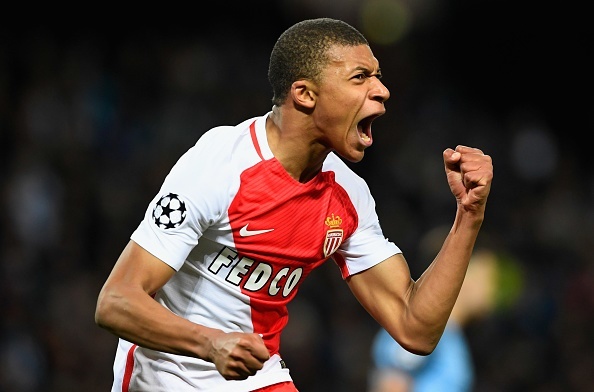 18 years old Kylian Mbappe has been exceptional in the UEFA Champions League for Monaco and was vital in the campaign. On 21 February, Mbappé scored Monaco's second goal in the 40th minute with a thunderous half-volley after receiving Fabinho's long ball over Manchester City's back line. It was his first ever UEFA Champions League goal and he became the second youngest French scorer in competition history behind Karim Benzema in the UEFA Champions League round of 16 first leg match against City, which Monaco lost 5–3. In the UEFA Champions League round of 16 second leg match at the Stade Louis II on 15 March, he made the score 1–0 for Monaco in the 8th minute by turning home Bernardo Silva's low cross from close-range (his 11th goal in his past 11 matches in all competitions) to help Monaco beat Manchester City 3–1 (aggregate score 6–6) and advance to the quarter-finals on the away goals rule. Though not in top form in their first leg meeting, Falcao is as dangerous as ever. On 5 November 2016, he scored twice in the first half as Monaco defeated Nancy 6–0 in a Ligue 1 match, following his two first-half goals against CSKA Moscow in a 2016–17 Champions League group stage match three days earlier. On 21 February 2017, Falcao scored two goals, the first with a diving header from Fabinho's cross from the right and the second with a chip over Willy Caballero, but missed a penalty in a 5–3 away loss to Manchester City in the Champions League's round of 16 first leg match. On 19 April 2017, he scored in Monaco's 3–1 victory over Borussia Dortmund to put the team into the Champions League semi-finals for the first time since 2004.